“prisma” is a researched keyword. 419 apps is the amount of apps that appear in search results when iPhone user in the USA types “prisma”. #1 under app logo on the right means that the app has the 1st place in search results for word “prisma”. 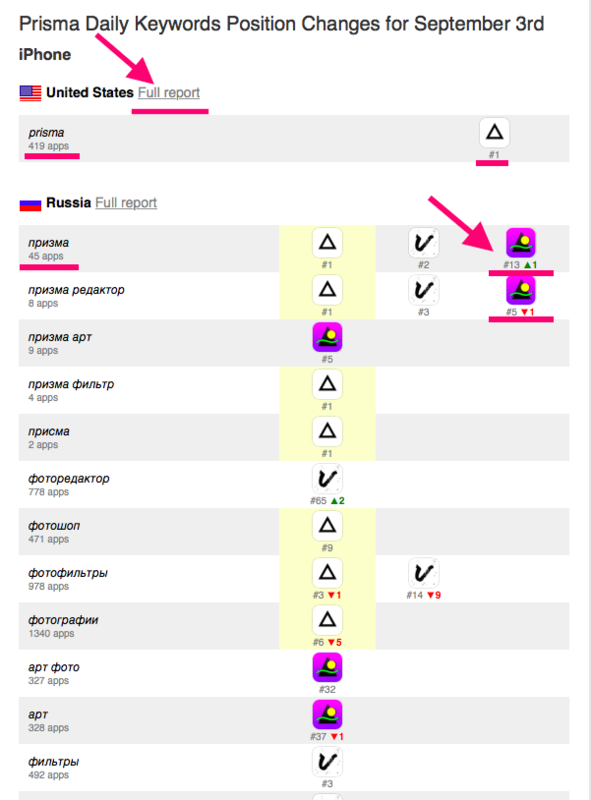 “призма” is a researched keyword. 45 apps is the amount of apps that appear in search results when iPhone user in Russia types “призма”. #1 under app logo on the right means that the app has the 1st place in search results for word “призма”. Other logos are the competitor’s app and their positions for this word: Vinci is #2 and Artisto is #13, which is🔼1 position higher than on previous day (or week). Further you see how Prisma app is placed for other keywords. Clicking Full Report will lead you to your AppFollow Account. For more information, see article Setting up Keyword Search. It’s important to know that currently Keyword feature is available only for TOP 100 apps in App Store (bundle apps are also counted however they're not visible) and TOP 50 apps in Google Play. Windows Store apps are not supported yet. The information about keywords is stored by default for 90 days, if you'd like to keep it for a longer time, please contact our support team. Btw if you feel overwhelmed with too many emails from us, feel free to set-up integration with team managers, for instance Slack.